PM Modi will address the SCO Summit tomorrow and is expected to meet Chinese President Xi Jinping amid growing differences between the two countries over the China-Pakistan Economic Corridor and India's Nuclear Suppliers Group membership bid. 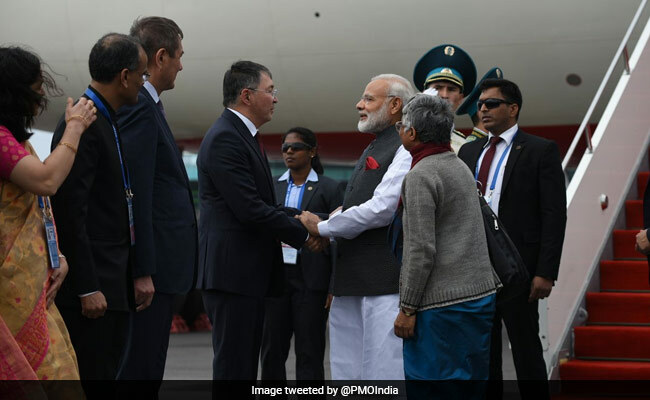 Astana: Prime Minister Narendra Modi arrived in the Kazakhstan capital today on a two-day visit to attend the Shanghai Cooperation Organisation (SCO) Summit where India and Pakistan will be inducted as full members of the bloc, in the first ever expansion since its inception in 2001. India's entry into the China-dominated grouping is seen as a major milestone as it is expected to increase the group's heft in regional geo-politics and trade negotiations besides giving it a pan-Asian hue. The Prime Minister will address the SCO Summit tomorrow and is expected to meet Chinese President Xi Jinping amid growing differences between the two countries over a host of issues, including the China-Pakistan Economic Corridor and India's Nuclear Suppliers Group membership bid. There is also speculation about a possible meeting between PM Modi and Pakistan Prime Minister Nawaz Sharif to ease the growing tension between the two neighbours. However, India has been maintaining that there was neither any request from Pakistan's side nor any such proposal from the Indian side for a Modi-Sharif meeting. President Xi arrived in Astana yesterday while Prime Minister Sharif reached the Kazakhstan capital today. The Prime Minister is also expected to meet a number of other foreign leaders, including Kazakhstan President Nursultan Nazarbayev. "I look forward to deepening India's association with the SCO which will help us in economic, connectivity and counterterrorism cooperation, among other things," Prime Minister Modi said ahead of his visit in Astana. SCO Secretary-General Rashid Alimov said entry of India and Pakistan will enhance the SCO's influence in dealing with pressing challenges and promoting trade and investment in the region. Inclusion of India and Pakistan into the SCO would mean addition of another 1.45 billion people which would make the grouping cover around 40 per cent of the global population. India, Iran and Pakistan were admitted as observers at the 2005 Astana Summit. The Tashkent SCO Summit in June 2010 had lifted the moratorium on new membership, paving the way for the expansion of the grouping. India feels as an SCO member, it will be able to play a major role in addressing the threat of terrorism in the region. Russia had been favouring permanent SCO membership for India while China pushed for induction of Pakistan.